Robert P. Miles is an inveterate lecturer and writer about Warren Buffett and Mr. Buffett's management style. His books have been translated into 6 languages and read worldwide. These compelling books, audio CD's and DVD programs are guaranteed to give you indepth perspectives on Warren Buffett, management styles, CEO's, business secrets, investment techniques, and long-term wealth building. The strategies and techniques of THE investment legend Warren Buffett Wealth follows the world’s greatest investor from the beginning of his career, as he takes a 100-dollar investment and turns it into one of the most successful multibillion-dollar companies in the world. By carefully detailing how Buffett began his career and discussing what he learned from Benjamin Graham, this book reveals the true secrets to Buffett’s success. Readers will see how Buffett reached the pinnacle of his profession by following certain key principles such as investing in old-style traditional American companies, holding the companies forever, and hiring and keeping the same managers. Order this book now on Amazon.com! Also, available for Kindle! The first book to reveal the investment and management strategies of the Berkshire Hathaway all-star management team. Much has been written about Warren Buffett and his investment philosophy; little has been made public about the inside management of Berkshire Hathaway. With a market cap exceeding 100 billion , Berkshire Hathaway has a market value surpassing many icons of American business such as Dell, AT&T, Disney, Ford, Gillette, American Express, and GM. Drawing on his personal experiences as well as those of Berkshire's chief executives, officers, and directors interviewed for this book, Berkshire insider Robert P. Miles provides a unique look at the Berkshire Hathaway culture and its management principles. Read the Table of Contents, Excerpts, Editorial Reviews and more about this book on Amazon. Robert Miles is a successful entrepreneur, business owner, and investor who believes that everyone can be a smarter investor regardless of background, education, and income. In fact Miles says that one investment is ideal for virtually everyone to own--Berkshire-Hathaway. 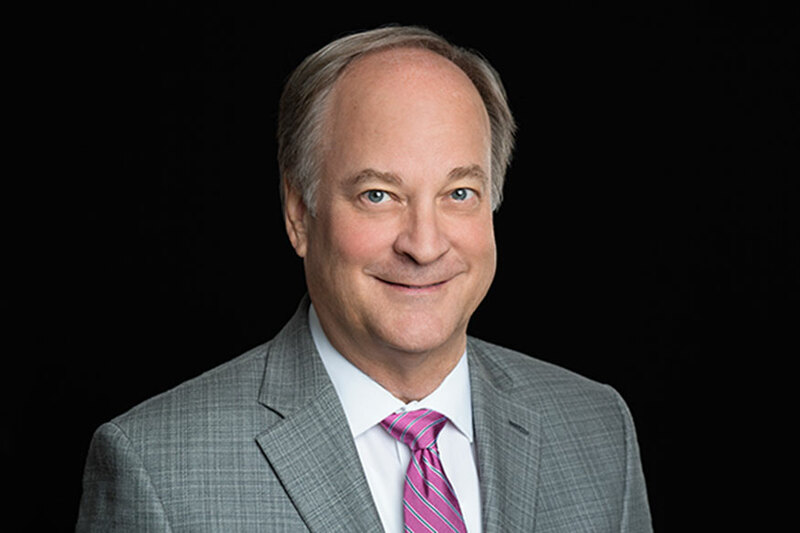 Miles has attended the annual shareholders meeting for years, has met Warren Buffett, and is considered a company "insider" and Berkshire-Hathaway expert. In 101 Reasons to Own the World's Greatest Investment, Miles offers his insights into what makes Berkshire-Hathaway so profitable and why shareholders get such value for owning the stock. Among his explanations: Berkshire-Hathaway is run sensibly and frugally by Buffett--there are no lavish corporate head-quarters or extravagant spending by company executives. The company invests in companies it determines will produce steady profits for the shareholders rather than those companies with a history of erratic performance. This accessible, well-researched look at the leading company's investment strategy has received an "unofficial" endorsement by Buffett himself. Robert P. Miles (Tampa, FL) is an entrepreneur and owns a small business. He is a graduate of the University of Michigan Business School, has been an active shareholder of Berkshire-Hathaway for a number of years, and is frequently asked to speak to other investor groups about Buffett. ...Read details on this book on Amazon.com...Order this book on Amazon.com! Also, available for Kindle! This 'audio presentation' and 'book' will share the simple yet uncommon philosophies that turned a $100 investment into a multi-billion dollar fortune. Learn the lessons of the one man who continues to make money no matter what the economic climate may be! You may be asking yourself how you can gain financial security in an economy that is constantly changing and highly unpredictable. In this unique and compelling program, you will be provided with insights and investment strategies that have weathered the violent storms and highs and lows of the ever-changing marketplace. Warren Buffett’s uncompromising work ethic, combined with his shrewd investment strategies have made him one of the richest and most respected men the world over. In HOW TO BUILD WEALTH LIKE WARREN BUFFETT: Principles and Practical Methods Used by the World’s Greatest Investor, acclaimed author and Buffett expert Robert Miles brings to light Warren Buffett the man, along with his simple yet highly effective business and investing principles. You will be inspired and motivated as Robert recounts the story of how Warren Buffett single-handedly became a self-made billionaire solely by investing in stocks and businesses that he believed in. You will learn how a simple $100 investment that he made in 1957 grew into the billions that have made him the world’s second richest individual to date. • How Warren Buffett grew his empire and how you can apply his investment principles and strategies to build yours. • How to decipher the kind of investor you are and the kind of investor you’d like to be. • How to choose investments that are steadfast and have long-term track records. • Who Warren Buffett’s mentors are and how you can apply their lessons to your life. • How you can benefit from becoming an investment owner rather than a trader. • The wealth-building strategies of Warren Buffett and his successor, Lou Simpson. • How traditional investment diversification may not be a strategy that works in your best interest. • How to break away from following the masses and find your own unique style. • Why you should focus on investing your money on Main Street rather than Wall Street. • Examples of Warren Buffett’s impeccable character and how building your own personal character will ultimately affect all of your business and financial ventures. • How imperative it is to buy a business with effective management and maintain it as such. So sit back, listen, learn and laugh as you join Robert Miles in this intimate and heartwarming portrait of the man who has single-handedly created one of the most lucrative financial empires the world has ever known. Order this set of 6 CD's or 6 cassettes plus guidebook and video! Order this Series on PayPal! Click to order cassettes on PayPal! Click to order CD's on PayPal! 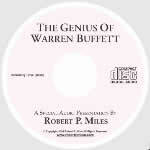 Order this recording by contacting Robert P. Miles and requesting the "Genius of Warren Buffett" Audio CD. This recording is an audio adaptation of The Warren Buffett CEO book. Warren Buffett Managers profiled in Part One of this series include Rose Blumkin (Nebraska Furniture Mart); Susan Jacques (Borsheim's Jewelry); Rich Santulli (NetJets); Eliot and Barry Tatelman (Jordan's Furniture); Bill Child (R.C. Willey Home Furnishings); Ajit Jain (Berkshire Reinsurance); and Al Ueltschi Founder/CEO (FlightSafety). Also included is a summary of their common traits. 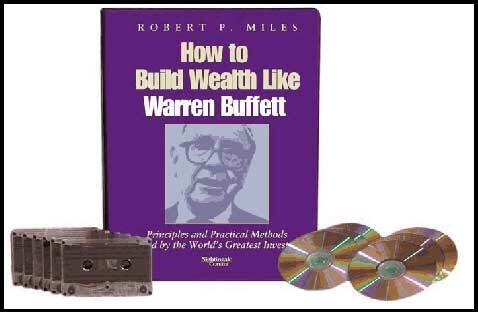 Order this recording by contacting Robert P. Miles and requesting the "Warren Buffett Managers" Audio CD. 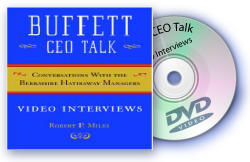 Buffett CEO Talk Video Series includes half hour DVD interviews each with Barnett Helzberg (Helzberg Diamonds), Stan Lipsey (The Buffalo News) and Bill Child (R.C. Willey Home Furnishings). Plus 3 bonus audio CDs including 'The Genius of Warren Buffett', '2003 Graham Buffett Book Conference', and 'Reflections of a Billionaire CEO: How to See YOU in the Image'. Each CEO interview was taped before a live studio audience and includes questions from college students, faculty and international investors. Special Limited Offer: Internet special $99.95 includes worldwide shipping. Regularly $224.70 ($49.95 for each video and $24.95 for each audio) representing a savings of $124.75. Click on 'Buy Now' to pay by credit card.